At 0010 hours LT, the crew was erecting the platform rig on the platform after moving it from the “C” platform, preparatory to conducting workovers on specific wells. Weather conditions were fair, partly cloudy with visibility of five miles and air temperature of approximately 80 degrees. The wind was from the east at approximately five knots per hour with seas running about two feet. The rig, Pride 14, replaced a rig that had been working in the field for several months and had been sent in for repairs and stacking. 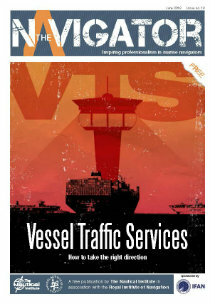 The crew assigned to the Rig had been working continuously in the South Pass 62 Field for at least three months. The Rig, while new to some of the crew, had been previously manned by the driller for a number of years. A five-man crew, the nightshift, had been rigging up since approximately 1800 hours. At approximately 0010 hours, the next step in the rig-up process was to raise the derrick by hydraulic jacks. 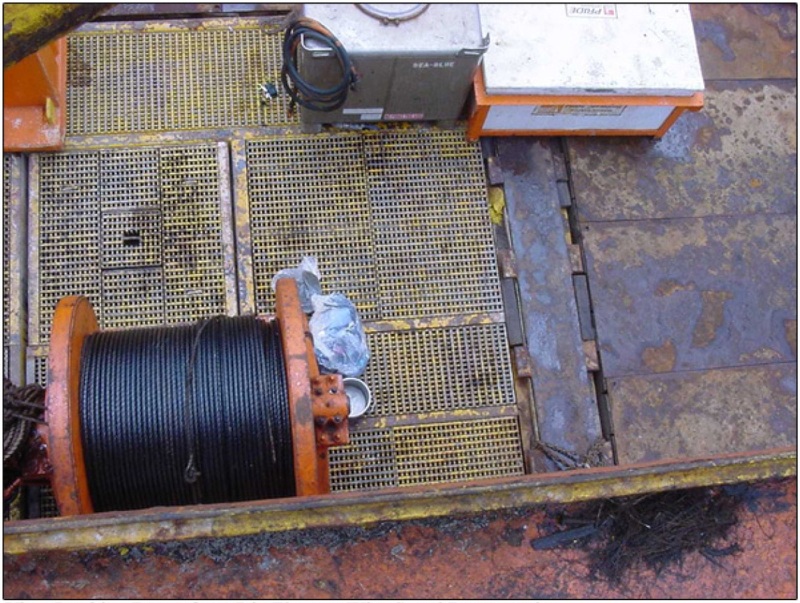 To raise the derrick fully, the derrick heel extensions had to pass through slots in the rig floor (see photo below) to pad eye brackets located in wells three feet below the rig floor. Once fully raised, the heel extensions were to be pinned into place on the pad eye brackets. At the pre-job safety meeting, the driller briefed the others about this particular operation and discussed the job hazard analysis (JHA) and the written job safety analysis (JSA). 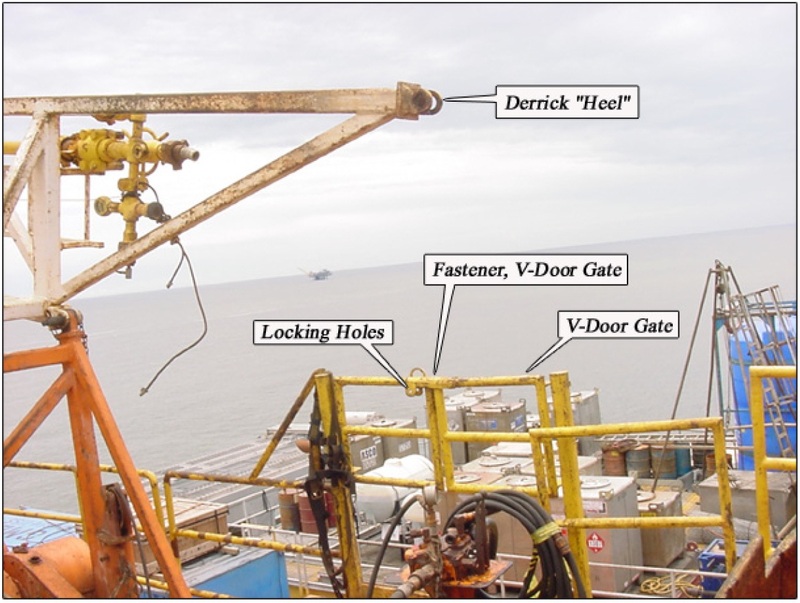 The driller told the crew to be aware that the derrick heel extensions tended to hang up on the rig floor walkways while passing through the slots on the rig floor. He instructed the crew in the use of pry bars to guide the heel extensions into the wells. In addition to the driller, the crew raising the derrick consisted of the tool pusher, the derrickman, and two roughnecks. The toolpusher was working the hydraulic lifts, while the driller and derrickman of Incident were guiding the right-side heel extension. The two roughnecks, were guiding the left-side heel extension into the floor well. The left heel extension was known to bind on the rig floor walkway, so the roughnecks had a pry bar to assist the passage of that heel. The derrickman and apparently the driller were braced on the right-side handrails, pushing the right heel extension to guide it into the proper floor well. The derrickman was braced against the handrail post connecting the fixed handrail with the gate that closed off the right-side V-door (see photo below). The driller was apparently braced against the right-side “V” door gate. 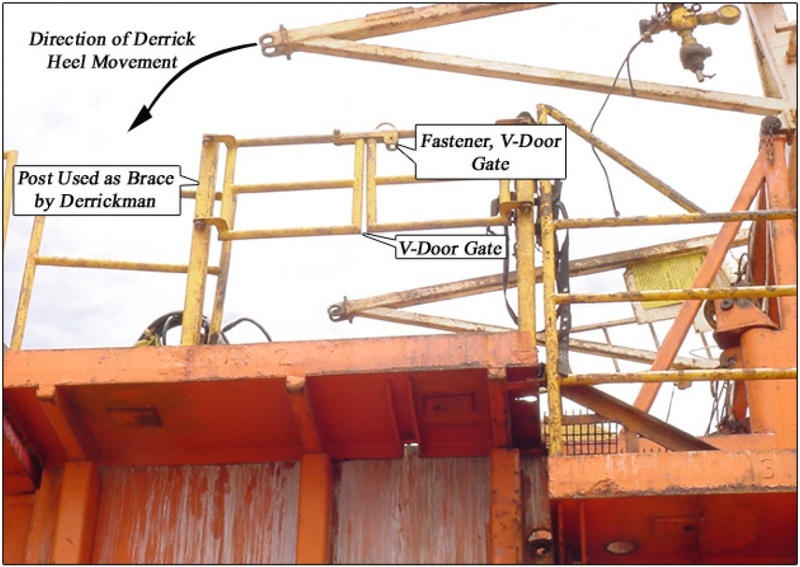 The distance from the heel of the derrick to the railing and V-door gate is approximately 28-30 inches and the top of the V-door gate is approximately 4 feet, 1 inch from the rig floor. The tool pusher was slowly raising the derrick as the crew guided the heel sections into place, when the right-side V-door gate suddenly and inadvertently opened. The driller, who apparently was braced against the gate, fell backwards off the rig floor through the V-door, losing his hard hat. 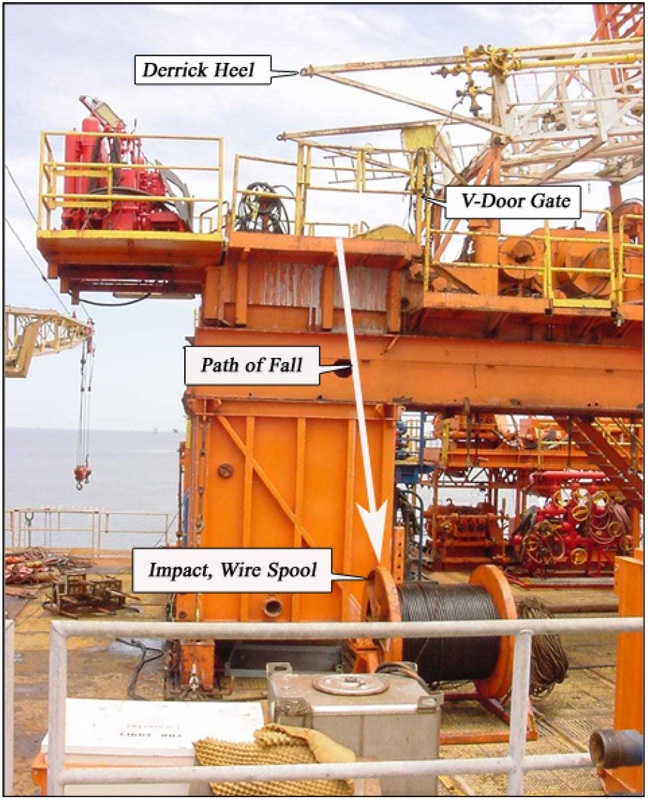 He impacted upon a wire rope spool on the deck 19 feet below the rig floor, resulting in his death (see photos above and below). The operation was shut down, and the company man and day tool pusher were called. 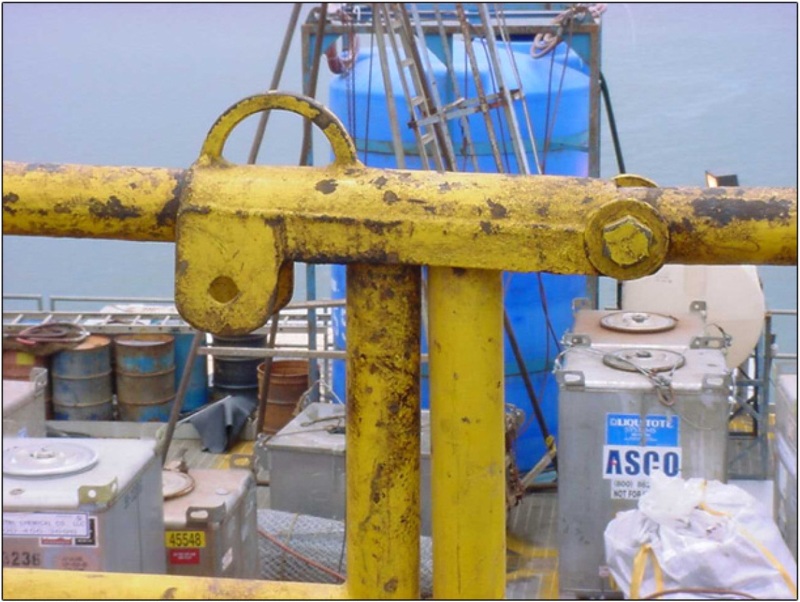 After running down to check on the driller, the tool pusher returned to the controls of the hydraulic lift and laid the derrick back down in its headache cradle. The Coast Guard and a Med-Evac were called while CPR was administered to the driller. Due to inclement weather conditions, Med-Evac was unable to respond. 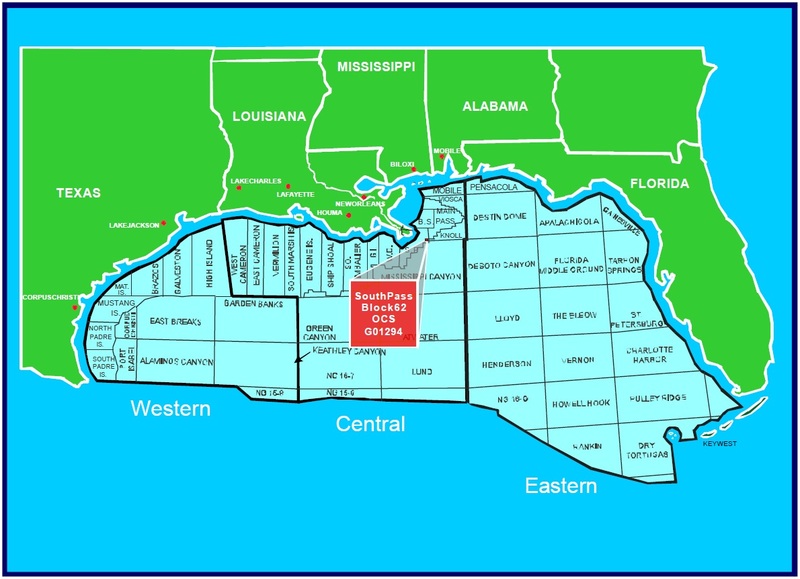 When the Coast Guard arrived, the driller was evacuated from the rig and taken to East Jefferson Hospital, where he was pronounced dead. The failure by the Contractor to recognize the possibility of inadvertently opening the fastener and including that danger in the JSA or JHA. The lack of a policy or procedure specifying a positive latch or lock on the V-door gate. The Fastener was a type that opened by simply raising a connecting mechanism (see photo below). The Fastener was not latched or kept from being raised by any positive catch method. The Fastener could be raised by the clothing of a worker catching the mechanism while crouched and then his subsequently standing up.